Welcome to QAHN's "Youth Volunteer Bank." 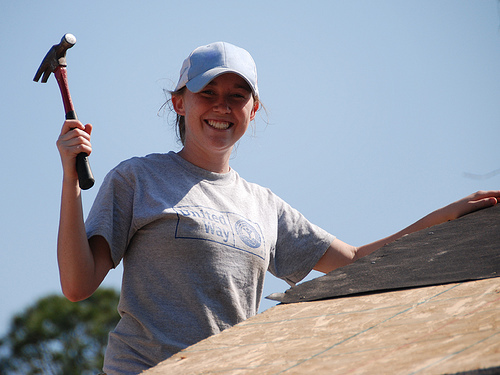 If your organization is looking for volunteers aged 15 to 24 to help out with its projects, why not let us know. We may be able to help. --and if you want this information publicized on this website. Simply email us the above information to: home@qahn.org. Or call us at: (819) 564-9595 / toll free (877) 964-0409. Volunteering is a great way to gain valuable career-related experience for your CV, and to build up your list of contacts. If you are between the ages of 15 and 24, and would like to volunteer at your local museum or historical society, why not let us know! We may be able to put you into contact with an institution that needs your help! Send us your name, age, the type of volunteer work that most interests you, the municipality you live in, and a telephone number and/or email address where we can reach you during the day. This information will be kept strictly confidential. Help make history come alive. Learn about the Château Ramezay Museum and Historic Site and become a volunteer guide at the museum. An Open House for prospective volunteers (age 18 and over) will be held at the museum on Monday, September 24, 2018 between 10:00 a.m. and 2:00 p.m.
Volunteer guides assist with school programs on weekdays and provide tours for tourists on weekends in the winter and daily during the summer. Volunteers also provide tours for special groups such as ESL students, groups from cruise boats, etc. Fairbairn House Heritage Centre, Hendrick Park, Wakefield, QC. -Advisory: members needed to plan exhibits, interpretation,archival services, outreach to students, special events. -Interpretation: We will have both hired and volunteer interpreters available to provide service in both languages to all ages. -Special events: we will have an outdoor stage in a natural amphitheatre by summer 2013, so need help planning for summer theatre, concerts, movies, etc. -Heritage New Carlisle (Kempffer Cultural & Heritage Centre) is always looking for youth volunteers to join their team! -Customer service in our local arts boutique, hosting (welcoming of guests, information giving, ticket sales, serving of coffee etc.) during special cultural events (concerts, workshops, conferences, exhibits, etc.). -Heritage New Carlisle really believes in giving a wide range of volunteering experiences to all. -Volunteers are needed at the Centre year-round (on call, for special activities/events), especially during high season (summer, between June and September). 1 Church Street, Stanstead, Quebec J0B 3E2. -The Haskell is always looking for volunteers to help with library work, guiding, fundraising and other activities. The need is year-round. Please call us!